On behalf of the Organizing Committees, we are very pleased to present the Second Announcement on the IV International Symposium on Fig to be held at the National School of Agriculture of Meknès, Meknès (Morocco) from September 29 to October 3, 2009 under the auspices of the Moroccan Ministry of Agriculture and Ficheries, the International Society for Horticultural Science (ISHS) and the Centre for Advanced Mediterranean Agronomic Studies (CIHEAM). All aspects related to Fig cultivation and growing (genetic resources, germplasm characterization, biotechnology and molecular markers utilisation, cultural practices, pest management, post-harvest, economics; etc.) will be covered taking into account the most recent scientific and technical findings. The program (see program) will include thought-provoking lectures by invited speakers in each of the sessions covered, as well as a diverse selection of oral and poster presentations. During the symposium, you will have the opportunity to visit germplasm fig collections, fig nurseries, fig drying units and fig orchards through technical tours across the main fig production areas. Information related to the symposium will be periodically upgraded on the symposium website. Therefore, interested people are warmly invited to frequently visit this website in order to be informed about any program and deadlines change. Selected social events will be scheduled for participants and accompanying persons. English will be the official language of the symposium. Different registration fees have been defined in relation to I.S.H.S. membership, time of registration (early, late and on desk), status of the participant and accompanying persons. You are invited to register as indicated in the Web page (see registration). The Scientific Committee encourages participants to make contributions on any aspect of Fig cultivation and growing. Abstracts should be submitted to the Scientific Secretariat before May 31, 2009 (see call for paper title and abstract submission). The Scientific Committee will examine abstracts proposed by participants and take a decision concerning acceptance and type of contribution (oral or poster). Corresponding participants will be officially informed about this decision by June 15, 2009. The call for papers and information on posters and oral presentations are available online (see final full papers). Full papers must be sent before September 10, 2009. Participants without contributions for the symposium or Accompanying person can mail directly to the secretariat of the symposium. The CIHEAM (International Centre for Advanced Mediterranean Agronomic Studies) will award a limited number of scholarships that may cover registration fees, accommodation and travel (see scholarships). A list of Hotel and accommodation facilities will be indicated on the web site. Meals will be mainly based on Moroccan cuisine. You will enjoy the mild beginning fall temperatures of Meknès located on the Saïss plateau. The organizing committee will do its best to make enjoyable your stay in Morocco. 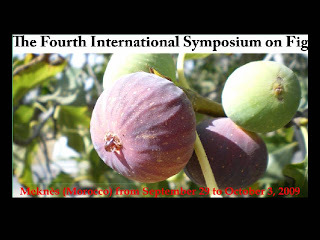 We look forward to having you join us to the IV International Symposium on Fig, September 29 -October 3, 2009 at the National School of Agriculture of Meknès, Meknès, Morocco!